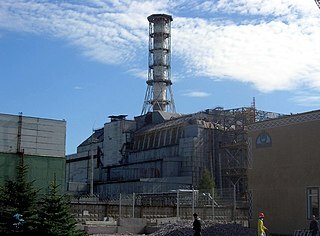 The Chernobyl reactor #4 building as of 2006, including the later-built sarcophagus and elements of the maximum-security perimeter. This image, which was originally posted to Flickr, was uploaded to Commons using Flickr upload bot on 21 March 2008, 08:47 by Bubamara. On that date, it was confirmed to be licensed under the terms of the license indicated. current 13:51, 16 March 2011 1,280 × 960 (739 KB) Sgv 6618 Improved quality, removed distortion.